We’re going to kick this week off by taking a look at Hyatt Hotels. 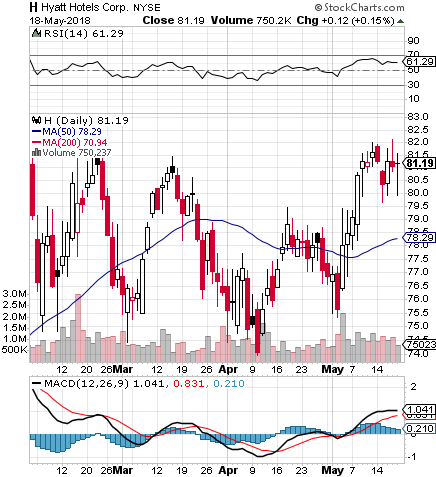 This is a stock with a relatively predictable and volatile trading pattern. As you can see on the chart, H is coming down off of a quadruple-top formation, with indicators suggesting a significant bearish swing could occur at any time. We want to designate a pair of contracts in the H options chain to track over the next week or two to coincide with this assumption. We’re going to slate the H 06/15 $85 & $80 Puts for observation as we kick off this fresh trading week. 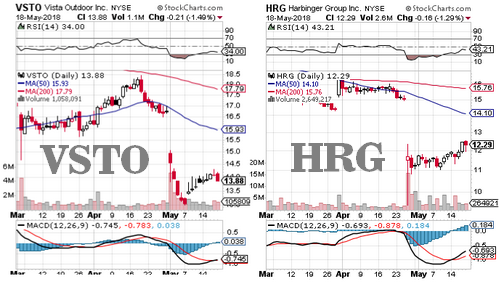 We are going to flag Vista Outdoor, Inc. VSTO and Harbinger Group, Inc. HRG for technical reasons as well today, with each stock boasting a highly similar setup. If you notice the side-by-side view of the charts below, both stocks have been working their way up off of a bottom, with a huge gap on the chart to the upside just waiting to be filled. We see these setups often, and in both cases here, the chances for a gap-fill appear greater than average.